Glucose is a sugar. It is a sweet-tasting compound that is well dissolved in water. There are many uses of glucose as a sugar. In chemical terms, glucose is a monosaccharide. It is a monomer unit for the formation of polymer molecules known as polysaccharides. There are a number of polysaccharide compounds that include glucose units. Therefore, it is an abundant molecule in nature. Glucose and dextrose are almost the same. 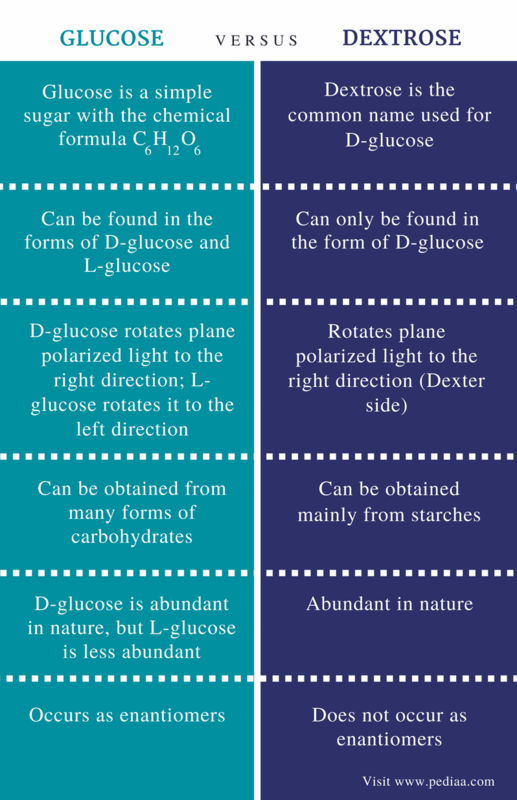 But these terms are different when considering their chemical structures; glucose molecules can be found in both D-glucose form and L-glucose form but, the term dextrose is used only for D-glucose molecules. Thus, the main difference between glucose and dextrose is that glucose includes both D-form and L-form whereas dextrose includes only the D-form of glucose. Glucose is a simple sugar with the chemical formula C6H12O6. It is a well-known monosaccharide molecule that is used in the formation of important polysaccharides. Glucose is a sweet tasting compound and is well dissolved in water. When considering the chemical structure of glucose, it can be given mainly in three forms as Fischer projection, Haworth projection, and chair conformation. Among these structures, chair conformation is known to be the actual structure of the molecule. However, let us consider the easiest structure, i.e., Fischer projection, of a glucose molecule in order to understand the different forms of glucose. Fischer projection gives a 2D planar structure of the molecule. The above image shows the two different forms of glucose molecule as their Fischer projection. These are called enantiomers. This means they are mirror images of each other. In D-glucose, one –OH group of the molecule is on the left side while all other –OH groups are on the right side. But for L-glucose, it is totally opposite. Here, one-OH group is on the right side where all other –OH groups are on the left side. Glucose has many different uses. It is used in food industry as an ingredient for sweet tasting food. This is because it is a simple sugar and is highly abundant. Athletes use glucose to gain energy. There are some medical uses of glucose as well. For example, glucose is used to treat hypoglycemia (low blood sugar). Dextrose is the common name used for D-glucose. Therefore, the chemical formula of dextrose is the same as in glucose. Glucose can occur in two forms as D-glucose and L-glucose. Dextrose is the form of glucose having one –OH group on the left side and all other –OH groups on the right side of the molecule in its Fischer projection. Dextrose is obtained from starches. 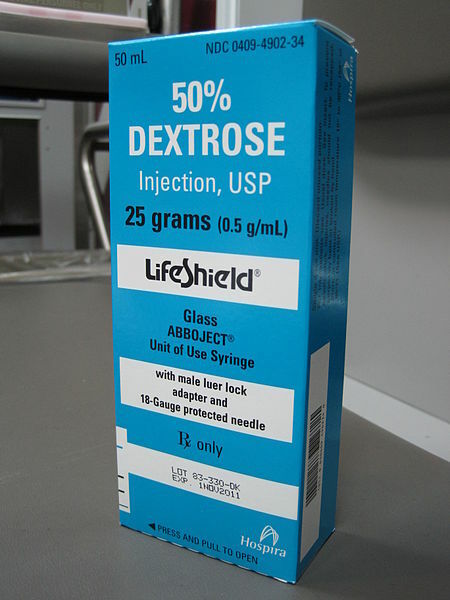 Dextrose is available as a powder or in liquid form. Dextrose is one of the most commonly used ingredients in packaged foods because of its affordability and wide availability. Baked products and deserts are often composed of dextrose. However, dextrose is about 20% less sweet than sucrose (common sugar/ table sugar). Adding dextrose instead of sucrose is considered to be extending the shelf life of the product. Dextrose is capable of increasing the blood sugar very quickly. (Dextrose has a high glycemic index). Therefore, people with hypoglycemia in a dangerous level are advised to use dextrose in order to raise their blood sugar level in a short time period. The chemical formula of both glucose and dextrose is the same. D-glucose and dextrose are the same. The molar mass of glucose and dextrose is the same. Glucose: Glucose is a simple sugar with the chemical formula C6H12O6. Dextrose: Dextrose is the common name used for D-glucose. Glucose: Glucose can be found in the forms of D-glucose and L-glucose. Dextrose: Dextrose can be only found in the form of D-glucose. Glucose: D-glucose can rotate plane polarized light to the right direction (Dexter side) where L-glucose rotates it to the left direction. Dextrose: Dextrose can rotate plane polarized light to the right direction (Dexter side). Glucose: Glucose can be obtained from many forms of carbohydrates. Dextrose: Dextrose can be obtained mainly from starches. 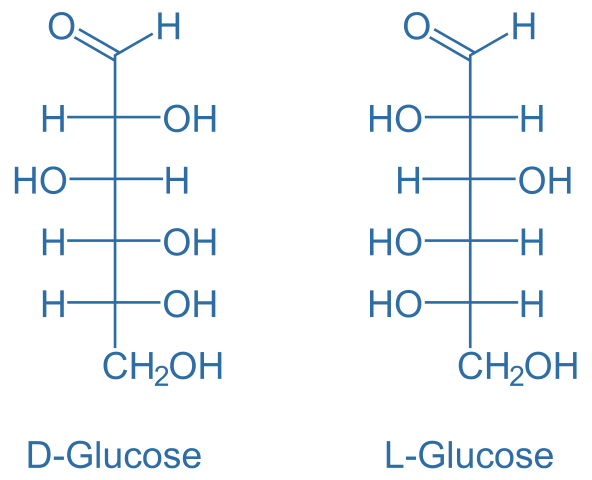 Glucose: D-glucose is abundant in nature, but L-glucose is less abundant. Dextrose: Dextrose is abundant in nature. Glucose: Glucose occurs as enantiomers. Dextrose: Dextrose does not occur as enantiomers. Glucose and dextrose are the same when D-glucose is considered. In other words, dextrose is the common name used for D-glucose. Therefore, most of the chemical and physical properties of glucose and dextrose are similar. The main difference between glucose and dextrose is that glucose includes both D-form and L-form whereas dextrose includes only the D-form of glucose. 1. Vance, Sara. “What is Dextrose and Why it’s in Your Food.” LIVESTRONG.COM, Leaf Group, 3 Oct. 2017, Available here. 2. “D and L Sugars.” Master Organic Chemistry RSS, Available here. 3. Yacoub, Jamie. “Glucose Vs. Dextrose.” LIVESTRONG.COM, Leaf Group, 14 Aug. 2017, Available here.